This trope is the reason this particular Interspecies Romance didn't go so well. For various reasons, humans may be illustrated realistically or in detail while animals appear cartoonish and/or unrealistic in a work of animated or illustrated fiction. The inversion of this is also not uncommon; where the humans appear cartoonish, while the animals appear realistic or detailed. Fictional creatures which are neither human nor animal (such as elves and intelligent human-like aliens) may be placed in either category for illustration style when appearing in a work that includes both humans and animals. This trope may also apply to works without humans if there is a similar animal to fill the same role. The human audience will generally recognizes the appearance of humans than other (real world) animal species, which could explain both straight examples and inversions of this trope. If the wild animals look unrealistic, then most of the audience won't notice because they don't remember exactly what that species really looks like. The humans may also look more detailed to diversify their appearance. For inversions of this trope, this may be because it is easy for humans to recognize a character as a human even when the appearance is simplified, while they need to see more detail to know exactly what type of animal a character is. No Cartoon Fish is a sister trope, where fish are realistic and detailed while everything else isn't. This is a Graphical Trope. Also see Cartoon Creature and Non-Standard Character Design. In the setting of Jeff Smith's Bone graphic novel series the humans are quite realistic, while the wild animals are more cartoony; except the rat creatures—the antagonists, who are the most detailed (though not realistic). The Bone brothers break the pattern, being extremely cartoony humanoids; a visual reminder that they're only visiting from a distant land where things are implied to work by different rules. In the newspaper comic Bloom County and its sequels, the animals were always cartoony, but got more so during the several occurrences of Art Shift throughout the series. An American Tail: The humans are realistic, but the mice, cats, and other animals are cartoony. Cinderella: The animals (the mice, the songbirds, the chickens, Bruno the dog, Major the horse, and Lucifer the cat) are cartoony but humans are semi-realistic or at least less cartoony than the animals. The four mice-turned-horses and other horses other than Major are semi-realistic though. The Little Mermaid has cartoony fish and birds but relatively realistic humans. The Great Mouse Detective: The humans are realistic, but aside from the realistic horses, the animals (the mice, bat, rat, cat, dog, lizard, and octopus) are cartoony. Ice Age; the original film only, as the sequels strangely didn't have humans. Although a few talking animals such as Manny had fairly realistic anatomy—Sid the sloth had strange eyes on the side of his head, as well as some other stylistic shapes on supporting characters. The adult humans looked fairly realistic, and the baby to a lesser extent. Mr. Bug Goes to Town has cartoon bugs against rotoscoped humans. Mulan: The humans are semi-realistic, while Cri Kee the cricket and Mushu the dragon are cartoony. Khan the horse is semi-real though. Over the Hedge has big-headed cartoonish animal protagonists. All of the humans are somewhat realistic, with accurate proportions. Snow White and the Seven Dwarfs: Snow White, Prince Charming, the Queen (before and after transforming into a hag, but especially before) and the Huntsman are realistic, while the animals are more cartoony, although still semi-realistic. The Dwarfs are appear as heavily cartoonized humans, the most cartoonish in the film. The Spongebob Squarepants Movie has cartoonish animated anthropomorphic sea-creatures. All humans (David Hasselhoff and the scuba diver/shopkeeper) are live action. The scenes outside of water have live-action backgrounds, and the sea creatures are live action when they dry and die. The bees and other insects in Bee Movie are cartoonier than the humans. The Ferals: The humans are played by actual people while the animals are played by puppets. Aside from Dr. Eggman, humans in the Sonic the Hedgehog series from Sonic Adventure to Sonic the Hedgehog (2006) (pictured above) were rendered as anime or realistic styled, compared to the very cartoony Funny Animals. 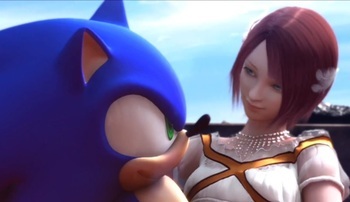 This is averted in Sonic Unleashed, where the humans are made to look like Pixar characters. In Dora the Explorer, protagonist Dora and the other human children look cartoony, and the adults are more realistic. However, her anthropomorphic animal friends are more cartoony, often more so than the children. Her sidekick Boots the monkey, and a few other animals, hardly resemble the animal that they are supposed to be. Baby Jaguar and other animals in Go, Diego, Go! are more realistic than Boots, Tico, Benny, Swiper, Isa, and other animals in Dora the Explorer and are as realistic as the humans in both shows. Most of the incarnations of the Alvin and the Chipmunks franchise, but moreso the 1983 cartoon series Alvin and the Chipmunks, the 1987 film The Chipmunk Adventure, and the two VHS movies released in 1999 and 2000, Alvin and the Chipmunks Meet Frankenstein and Alvin and the Chipmunks Meet the Wolfman; in these incarnations, the human characters have rather realistic designs (especially true for The Chipmunk Adventure), while The Chipmunks and Chipettes are cartoony, roughly three feet tall, and walk, talk, dress, and eat like people. Played straight and subverted in Alvinnn And The Chipmunks. The humans are realistic whereas the Chipmunks and the Chipettes are cartoony. However, animals other than the Chipmunks and Chipettes are realistic. In Spongebob Squarepants, most of the characters are cartoonish animated anthropomorphic sea-creatures. Patchy the pirate, and his friends, are live action humans (and a mermaid)—save for his pet parrot, who is a puppet. In an episode where Spongebob and Patrick go on land, they appear as live action puppets outside the water. Mermaid Man and Baracle Boy are the only cartoony humans in the show. Played straight and subverted In Gaspard And Lisa. The main dog characters and their family and relatives are cartoony and over-stylized, whereas the other animals (like Burlee the kitten and even non-anthropomorphic dogs) and the humans are semi-realistic. We Bare Bears: The bears and other animals are drawn in a simple, graphic style, while the humans, although still cartoony, are more detailed and realistically proportioned. TOEI animation's Digimon shows, where some of the monsters look more like real-world creatures than the humans, to say nothing of the animals. Chi's Sweet Home: The humans, who have Black Bead Eyes, and the cats are more stylized and toony, while the dogs, parakeets, songbirds, snakes, frogs, rabbits, and other animals are semi-realistic. In Futari wa Pretty Cure, one of the main character's has a dog that is much more realistic looking than her. Several Pokémon in The Electric Tale of Pikachu, such as Charizard, Gyrados, and even Pikachu to an extent, are drawn in a more semi-realistic fashion compared to the humans. Harlem Beat features a realistic Collie but far less realistic humans. Maus, a true Holocaust story, is an interesting (strange) example. All Jewish people appear as cartoonish, anthropomorphic mice, but this is just a metaphor, as they are humans in-universe. Other humans appear as other animals; such as Polish pigs, American dogs, and Nazi cats. In a panel in the first book, a real rat is seen running on the floor of a room that some Jews went into. There was a comic within a comic in this book written by the protagonist, in which the characters are detailed and fairly realistic humans. In Calvin and Hobbes people are drawn in a very cartoony style while animals (except for Hobbes) are almost always drawn in a very realistic style. Brave: The adult bears, Mor'du and Ellinor as a bear, the dogs, and the fish caught by bear Ellinor look realistic, but the humans and Merida's triplet brothers as bears appear semi-realistic or cartoony, more typical of the Pixar style. Up. The human characters are very caricatured (Carl's face is a perfect square, Russel's facial features are too close together, Muntz is unrealistically skinny), but the dogs (apart from Dug, whose eyes clearly show sclerae and are placed close together) look like real dogs. Kevin the "Snipe" is cartoony, but then, on the other hand, her species is fictional, so what is her species meant to look like? LEGO minifigures have simplistic shapes and unrealistic proportions (as well as all-yellow skinnote Except for sets licensed from media), probably to match the rectangular style of Lego pieces and models. The animal figures, however, have better curved shapes and more realistic proportions—probably so that humans will recognize their genus/species. In Go Vacation, humans are anime-styled while animals look more realistic. In The Whiteboard, the Funny Animal main characters are drawn in a fairly realistic style, while human extras are drawn as featureless "bubbleheads" distinguishable only by their clothing. Inanimate objects are the most detailed of all, since before starting the comic the author mostly drew hardware or machines. Later on the comic switched to just having everyone be funny animals, and implied that the extras' earlier "human" appearance was simply a lack of description rather than an indication of species. In Hyperbole and a Half, none of the pictures are drawn completely realistically, but the animals (usually dogs) have a tendency to be drawn with more complexity than the humans, who can look like they were drawn by a five-year-old. In TetZoo Time!, the humans are cartoony like in the show it is based off of, while the animals are realistic aside from having dots for eyes. The humans are cartoony, but the animals in later seasons are realistic. Dogs, cats, and cattle are still cartoony however. Averted in the earlier seasons as both the humans and the animals were cartoony. Also averted with the Canadian humans and animals as both are cartoony. The Simpsons: Except for those introduced early on the series (Blinky the fish, Snowball II, Santa's Little Helper), animal characters are depicted more realistically than the humans. From the beginning the producers established a rule that animals would behave as they do in real life, although that rule has gotten a little looser in later seasons. This trope applies to Stampy the elephant the most as he is actually semi-realistic, unlike most of the other animals and the humans. The Funny Animals from The Itchy & Scratchy Show, however, are exempt. In The Wild Thornberrys, the humans are very cartoonish. Most of the wild animals in the show, who are numerous, are more realistic. Darwin the chimp is as cartoony as the humans however. Sanjay and Craig: The human characters and Craig the snake look cartoony, but the other snakes look semi realistic. Bob's Burgers: The human characters look cartoony with very weak chins, but the other animals, including the horses appear closer to semirealistic. In Gravity Falls, animals are depicted more realistically than the humans. Wild Kratts: humans are cartoonish, while animals are realistic. Played straight and inverted in Turbo. Inverted with the crows and beetles as they are photorealistic and more realistic than the humans, who are semi-realistic. Played straight with the snails, who are cartoonier than the humans. Pinocchio: Monstro the whale, the tuna he eats, and the moths are semirealistic, but Cleo and the other fish shown, Figaro and Gideon the cats, Honest John the fox, the boys turned into donkeys, and Jiminy Cricket (who is also an Informed Species) are cartoony. The Blue Fairy (basically a woman with wings in appearance) is realistic and Rotoscoped so as to look ethereal, but the humans (Geppetto, Stromboli, Coachman, Lampwick, Pinocchio as a real boy) are cartoony to almost semirealistic. The Blue Fairy as a dove is also realistic. Pinocchio as a puppet is cartoony with Four-Fingered Hands.